You may have previously wondered what in the world you would do regarding your garage if the power cut out one day. If your system is automatic, this is where the emergency release handle comes in particularly handy. When you pull on this handle, it disengages the door from the automatic opener. This is especially important if there is an emergency. If something or someone gets trapped under the door and the opener fails to work, you would simply pull the emergency release handle and the door would become mobile again. You may have to call on our service technicians to reset it again, however, most times the release will automatically set itself. If you suspect there may be something else going on with your door, like rollers off track, or a broken spring or cable, we suggest you avoid using the emergency release handle unless absolutely necessary. In this event, contact our team for assistance - we always suggest you err on the side of caution when it comes to safety. Importantly, if you release the emergency handle and there is an underlying problem with your door that you were unaware of, this may only manifest itself once you try raising the door. The door could come crashing down on top of you or your car. For this reason, we always recommend professional and routine maintenance - our experts can help ensure everything is working as it should be, and that you will confidently be able to use the emergency release if needed. DIY can be tempting, especially if you're keen to save money. However, attempting to do such things on your own could make the situation worse and pose a risk of injury. If you have doubts about regarding your emergency release - if you're not sure where it is, how to use it, or suspect that there may be something wrong, contact our technicians today at Garage Door Monticello to evaluate the problem. We'll be happy to help you out! 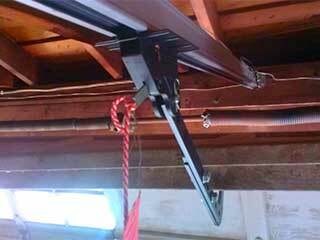 What Makes Up My Garage Door System? When you're looking for garage door specialists, our company is the only number you will ever need. Our team of professionals are the best in the industry for any maintenance, repair or installation work you need. Schedule your booking with us today. At Garage Door Repair Monticello we hold your satisfaction above all. Count on our team when it comes to clean and professional work. Thank you for choosing our company! Feel free to browse our website for more information in the meantime. Our team at Garage Door Repair Monticello is at your service any time!